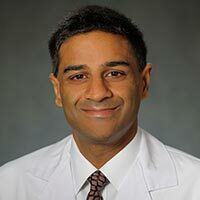 Radiation oncologist Dr. Ramesh Rengan has a special interest in pleural mesothelioma patients as the medical director of the Seattle Cancer Care Alliance Proton Therapy Center. As part of a multidisciplinary approach, Rengan provides a key element that has helped turn the treatment of mesothelioma from purely palliative to potentially curative, laying the foundation for a chance at long-term survival. Rengan works closely with a staff that includes medical oncologist Bernardo Goulartand thoracic surgeons Michael Mulligan and Farhood Farjah. All are dedicated to the treatment of mesothelioma. Rengan’s proton beam therapy is an essential part of the treatment plan. He is well-known for his work with lung cancer and other more common thoracic malignancies — always seeking better, more effective therapies. But mesothelioma patients often hit close to his heart. Rengan joined the Seattle Cancer Care Alliance (SCCA) and the University of Washington School of Medicine staff in 2013 after seven years at the University of Pennsylvania, where he served as assistant director of clinical operations, radiation oncology. Proton beam therapy for mesothelioma is one tool in an arsenal of other cancer treatment specialties. It is especially precise and effective, particularly combined with Rengan’s expertise. When used in conjunction with better surgical techniques and the latest immunotherapy and chemotherapy combinations, patients have a reason to hope. The SCCA tumor board meets regularly to discuss each mesothelioma case, designing a flexible, personalized approach that evolves strategically, depending upon a patient’s — and the cancer’s — reaction to treatment. Rengan received his degree from the University of Michigan Medical School. He did an internship at St. Mary’s Medical Center and his residency at Memorial Sloan Kettering Cancer Center in New York City. His clinical interests include thoracic malignancies, melanomas and other solid tumors. One of his current research projects involves the novel use of stereotactic body radiation therapy (SBRT) in conjunction with Yervoy (ipilimumab), a potent immunotherapy drug. Rengan also is developing an approach to radiation treatment that evokes a tumor-specific immune response in patients with metastatic disease. Disclaimer: Dr. Ramesh Rengan has no professional affiliation with Asbestos.com. Seattle Cancer Care Alliance. (n.d.). Ramesh Rengan, MD, Phd.